Designed by local PNW ripper, Aaron Witherell, the Lib Tech Air'n Wakesurf Board has been honed over the past few years and is now available to the public! Touted as his 'dream board', the Air'N Wakesurf Board's wide poppy tail block, speedy flat rocker, and mellow concave combine with its dynamic rail design for a catch-free, yet precise ride that allows riders to push the envelope of progression. As Aaron puts it, "This board is unbelievable. I never lack speed or pop and I don't bury the nose. The durability of these boards is better than anything else you can find. Having to worry about dinging the board on the boat are a thing of the past." Eco Impacto Thermo Pressure Fusion Process  Each of the 31 pieces used to construct ECO IMPACTO boards are new materials to the surf industry. The unique Thermo Pressure Fusion Process creates an amazingly durable, environmentally friendly, high performance surf structure that frees your mind and lifts your surfing to new heights. Freedom of Choice II Fin Box System  Introducing stage two of the world's best box: Lib Tech's high-performance adjustable Freedom of Choice fin box system. 40% lighter than conventional boxes. Two Tab compatible with high performance adjustability. 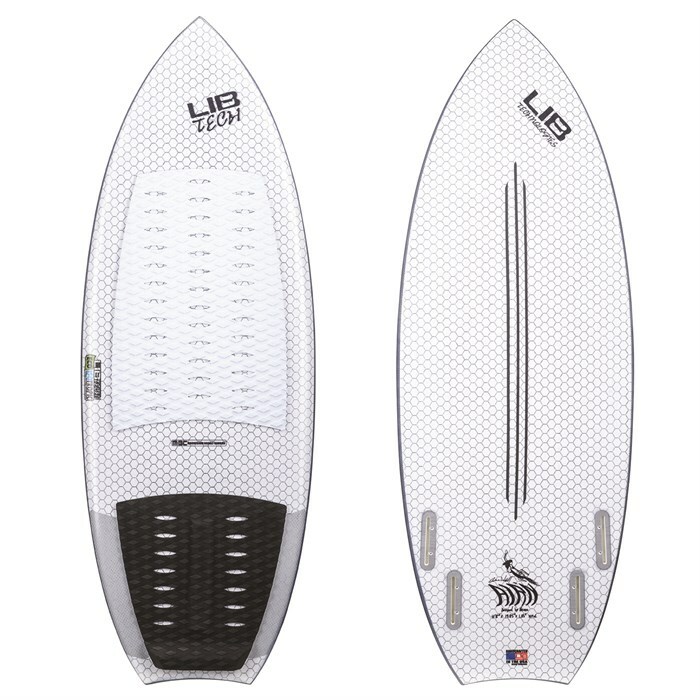 2-Tab Compatible  0.5" adjustability with two tab fins for precise tuning of your board's surf characteristics. Experimentation allows you to maximize your surfing performance and dial your board in for a variety of conditions. Lib Tech Leash Plug  6061 T6 Aircraft aluminum pin in a lightweight fiber composite cup. Do Not Store in Boat Board Racks  evo does not recommend storing your wakesurfer in boat board racks. Many wakesurf boards are fragile and can be easily damaged by these racks, which is not covered under manufacturer warranty.